Three times a year Truesdale will do a complete sprucing up of your landscaping. Depending on the time of the year – we will prune as needed, and add mulch to assure moist roots for your shrubs. Remove dead foliage from your plants and trim your perennials. 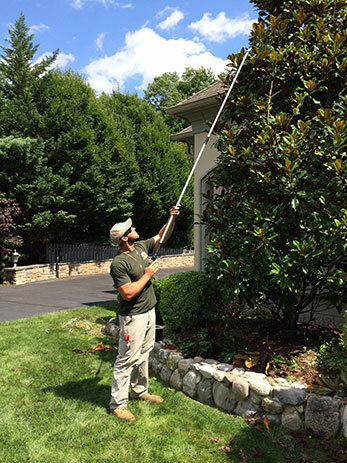 Our crews are trained in the precise way to prune these valuable shrubs and trees. Pruning is a dying art form. If you prune too early, you may be damaging your plants. If you prune too late in the season you might be cutting off next year’s blooms. An experienced landscaping company is who you should trust with this job. If you are interested in our shrub & beds maintenance program, then head over to our Contact page and fill out our short form. Additionally, feel free to contact us directly by calling 908-834-2675. "I've heard many compliments by neighbors and "dog" walkers ask who is taking care of my property. The men have been most professional and considerate, worth every $ I've paid!"